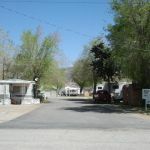 Ask fellow campers about "Trails End RV Park" and nearby attractions. If you need a place to get a good night's rest, keep driving because you won't get it here. The place is located next to the railroad tracks and all you hear is trains day and night. They blow the horn as they go by even at 2 or 3 in the morning. There are temporary workers living here and the place is overrun with weeds. The only positive is it is close to downtown Tehachapi. 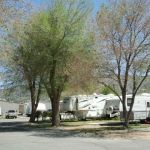 We camped at Trails End RV Park in a Fifth Wheel. This park is actually a Mobile Home Park with RV parking around the perimeter. About half the sites have concrete pads, the other half (around the east perimeter) are just grass and you need to 'angle' park to accommodate the space since there is not enough room to back directly in. The park is close to the train tracks, you will hear them pass through during the evening. The manager is very nice and willing to work with anyone although he will not take reservations. We called the day before to be sure there would be a space to park in. The park is also adjacent to the local airport, but it was pretty quiet the 2 nights we stayed here. The park isn't recommended for long term stay, but if you need to stay a night to rest up during your trip it will fit the bill. 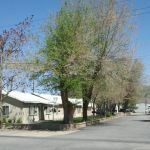 We camped at Trails End RV Park in a Travel Trailer. 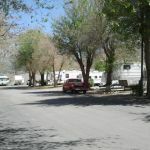 Are you affiliated with Trails End RV Park ?